The title of the Forum is derived from the term »ostranenie« [alienation], which was characterized in a 1916 essay Art as Procedure by the literary critic and pioneer of Russian formalism, Viktor Sklovskij. In our present media and information society, in face of the superficial viewing and vague interpretations of image reality which block the possibility of a deeper involvement with our environment, this »seeing through art« called for by Sklovskij is of greater significance than ever before. 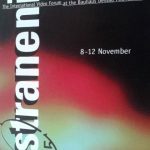 The first OSTranenie-Festival 1993, held under the title »Shattered Myths – New Realities« offered a broad overview of the artistic-visual activities of artists in the former Eastern Block. In the forefront was the individual coming to terms with the fundamental changes affecting virtually all aspects of life in Eastern and Central Europe. Against the backdrop of the recent revolutionary anniversaries – 50 years after German WW II capitulation and 5 years of German political reunification – the resulting loss of the polarization of political ideology has been followed by new societal definitions and opinions of order which are in a constant state of flux. 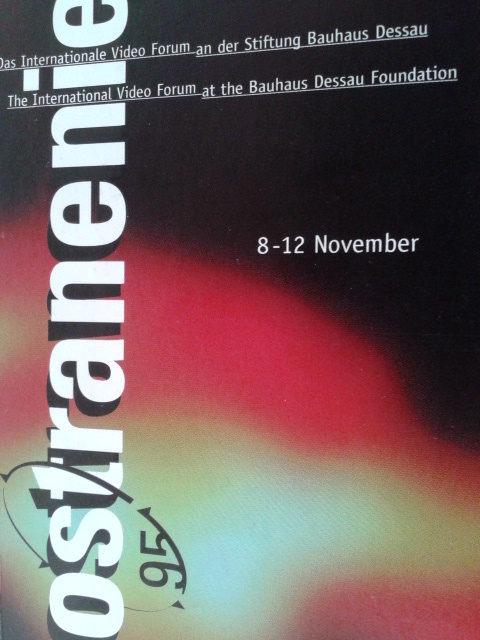 The Video Forum OSTranenie ‘95 is not a classic video or media competition but, via its various fora and spheres of communication, its presentation of Videos, Multi-Media Installations, Performances and Workshops aims rather at contributing to the structure of information about the emerging democracies of the former Eastern Block. OSTranenie ´95 places emphasis on the research and investigative confrontation relating to the specific roles and functions played by video and electronic media in the current process of social and cultural restructuring in this region, particularly in narrowing gaps of understanding between East and West. The interplay between the dominating potential for the control of state and public media against the autonomous world of the consumer society, each with its own definition of socio-cultural milieu, will form topics to be discussed in open symposia, lectures and workshops. Conflicts in these countries that are a result of adjusting to the model of an apparently stable West [or which result from attempts at catching up with or closing the gap on cultural politics and cultural infrastructure] will be debated. The difficulties which result from the new determination of cultural values in the orientation towards a market economy will be examined together with the idealism and criticism of visionary models of the future. The resulting contradictions that arise are, in both the negative and positive sense, intimately connected with the realization of media products. Through its endeavours in the artistic-cultural sphere, the Bauhaus Dessau Foundation sees itself as a location for joint learning, for experimental work to explore and mediate human expressive capabilities as well as being a bridge between East and West. Cultural and artistic relationships, which have existed traditionally between Germany, particularly between the Bauhaus Dessau, and Eastern and Central Europe, should be expanded upon in a contemporary artistic and media relevant context.